I am done with academics for the calendar year. Over the past few weeks, as my courses have wound down, I’ve been working up to jumping into work on Spartan Holiday No. 3., devoted to my Paris sojourn. Utah, the subject of the promised “Canyonland,” is being pushed back a few issues; I have chosen to work with the French material while still fresh. We bug our students about printing out work they find themselves responding to at a given moment, or during a given episode. There is a temporal element to what moves us: it shifts over time. Over the long haul there’s a macro continuity. But it’s too early for undergraduates–that is, to sense the macro. Even so, there’s nothing like attentiveness in the here and now. And early loves often stick. My studio pin-up wall gets refreshed every time I start a new round of sustained work. I’ve been working on it. I don’t think it’s done. Done being a slightly suspect construction. It’s always in flux, to a degree. But it does settle in for stretches. And I’m getting close. My go-to sources have remained consistent, but have also expanded. Not everything makes the wall, which is predominantly formal/visual and partly experiential. As I begin to get comfortable in the batter’s box, as it were, I thought I’d share a few things I’m looking at. (Looking at is incorrect and vulgar-sounding, but “at which I am looking” seems so ponderous. Better erroneous than gaseous.) I do so partly to back up my recommendations to students with practice, and partly to tease a few things out, which always happens when I write about what I’m seeing or making. 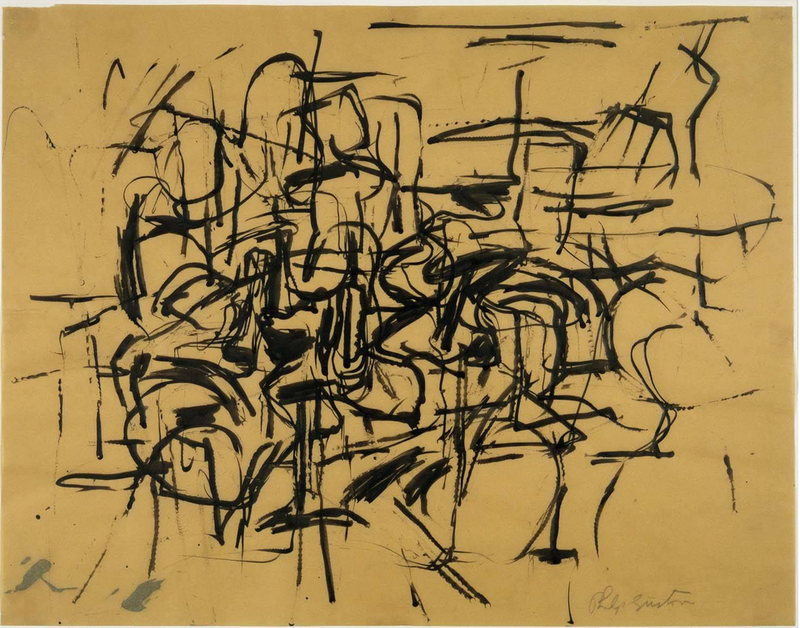 Philip Guston remains an important source for me, including the extended molting from social realist to abstract expressionist (late 30s to early 50s) and back again, from ab-ex pro to clumpy, bizarrely refined cartoonist (early 60s to late 70s). I remain preoccupied with the tension between depiction and abstraction, which I have come to see as the formal problem that drives my work. Seen at right, in much the same palette as Guston’s Ancient Wall (1976), a Navajo rug, a symbolic abstraction. Another emblematic American abstractionist, Stuart Davis, occupies a (nearly) fixed position in my artistic heavens. The Place des Vosges No. 2 has interested me for years; in Paris I saw what Davis saw, to my surprise. (He spent time in Paris in the late 20s, and was stimulated by it.) Davis’ Gloucester landscape gouache Shapes of Landscape Space (1938) is up on the wall now. Shapes is at the very top of this post. Part 2 will cover Parisian sources and discoveries. 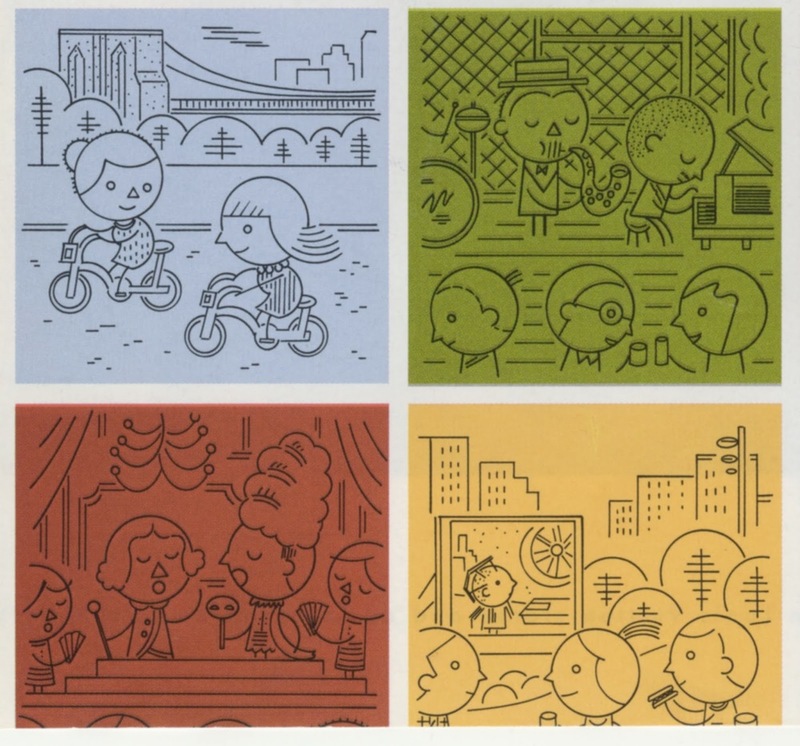 Ivan Brunetti, detail, Goings On Around Town. IllustrationDoug Dowd April 14, 2014 Tonic in the Air!